we do it right! When you’re looking for fantastic customer service combined with the best printing, the experts at the Commercial Print Division of Sierra Nevada Media Group are here for you. 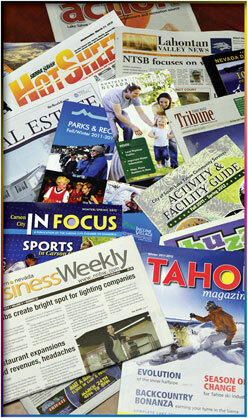 We specialize in providing quick turnaround printing of newspapers, tabloids, newsletters, election materials, coupon books and magazines up to 1,000,000 or more. And best of all, we do it all while offering you superior customer service combined with some of the best, competitive pricing throughout Northern Nevada. And if you’re looking for a high-quality gloss print on coated stock, our new UV (Ultra Violet) coldset press gives you a refined, professional print job typically reserved for heatset presses, but at a fraction of the cost. And for added bonus, we not only pass those added savings on to you, we increase the value by adding in additional time for deadlines. Unlike typical printers that can require up to 10 or 14 days lead time to print your gloss product, we can print one day and deliver the next, giving you valuable time to finalize time sensitive products like real estate guides and sales flyers.